It’s time to focus on family values and remember what’s important at Christmas. I, like nearly everyone, I assume, spend too much at Christmas. Things that seem hugely important and a must have, before the day, pale into insignificance afterwards and I usually start wishing I hadn’t spent so much. I’m on a mission this year to spend as little as possible, while still having a wonderful time with my husband and children. When I was looking for things to do for our 2 week activity plan in the summer, I realised how much money had been wasted last Christmas. I’m also going to be looking for the perfect home made gift for family members, that looks professional and costs as little as possible! I’ve said it before and I’ll say it again, I’m loving the start of autumn. Ant and I were out in the garden the other Saturday morning getting more of the ‘love bench’ done. The sun was shining but there was no warmth from it; infact, there was a slight chill in the air and it had that fresh morning smell, you know the one I mean? It was an absolutely gorgeous morning and I didn’t mind being out there at all painting plank after plank after plank after plank….ok, I’ll stop, you get my meaning! The previous Thursday, the kids had been picked up from school by Grandad, (everyone calls my father in law, Grandad, even my mum!) as is usual for a Thursday. He takes them to his house for dinner and brings them home at bedtime. They don’t, however, go straight home. He usually takes them to one of the nearby parks. This particular Thursday, they went to Whisby nature reserve and while there, they collected acorns. We used to collect acorns and pin them together (mum used to get a bit annoyed sometimes when we used all her pins without asking!) to make little acorn people. Grandad had a different use for them and one that I’ve never seen before. 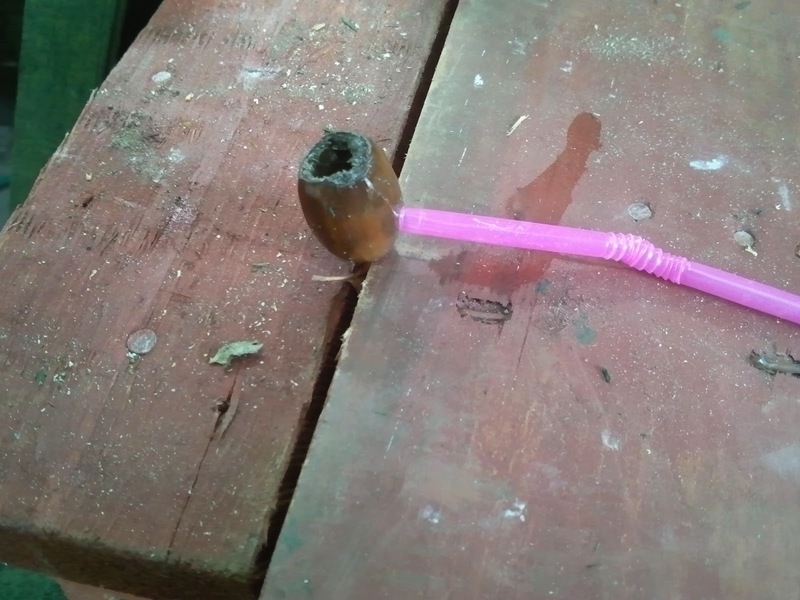 He hollowed out the acorn, cut a hole in the bottom big enough to fit a straw in and created an acorn bubble blower, (or if you cut the straw down, a small acorn pipe for a gnome….you choose!) which the girls adore! They made their own bubble solution using Tesco Honeysuckle and Silk liquid soap and water. This soap costs about 50p, smells lovely and makes great bubble solution! At that price, I don’t mind the kids using it for bubbles! I’ve bought them countless bubble wands, bottles of bubbles, motorized bubble blowers in the past and none of them have been as popular as Grandad’s home made acorn bubble blowers!